Get out the Kleenex and hit play on the Boyz II Men musical montages — it’s officially the end of an era. Three years after discontinuing the iPod classic, Apple is finally doing the same to its lower-end brethren, the shuffle and nano. The company pulled both iconic MP3 players from its site earlier today and has since confirmed with TechCrunch that this is, indeed, the end. That makes the iPod touch the last device standing with the once ubiquitous iPod name. And there’s actually some happier news on that front — the company is increasing the capacities of the touch to 64GB at $199 and 128GB at $299 today. It previously sold 16GB and 64GB models at the same prices. “Today, we are simplifying our iPod lineup with two models of iPod touch now with double the capacity starting at just $199 and we are discontinuing the iPod shuffle and iPod nano,” said an Apple spokesperson in a statement. For the past several years, Apple has been fairly clear that the iPhone would eat up the traditional non-network iPods — and that it was comfortable with that happening. The rise of the iPhone and the company’s push into streaming with Apple Music have helped make music ownership a thing of the past. The fact that there has been no nano updated in five years should have been a solid indicator (if you needed one) that Apple was focused on devices that can run apps. The most important of those apps for an iPod, of course, is Apple Music. It makes very little sense in Apple’s current universe for it to support devices that can’t. The iPod touch getting twice the storage at the same price is a nice send off for the no-radio iPods. It’s also a good opportunity to reflect on the role the music player and its software companion iTunes played in helping return Apple to its former glory. The iPod wasn’t the first MP3 player by any stretch, but it was the technology’s true breakthrough. Introduced in 2001, the clickwheel device would go on to become synonymous with the space and quickly became the 21st century’s first truly iconic piece of consumer hardware with the then mind boggling promise of putting “1,000 songs in your pocket,” as Steve Jobs said during the 5GB product’s unveiling. I was more of an iPod classic guy myself, but in those dark days before Spotify, when phone storage was at a premium, the shuffle and nano’s small size made them easier to carry around in addition to a phone. The shuffle arrived in early 2005, with the nano hitting later that same year, replacing the short-lived mini. 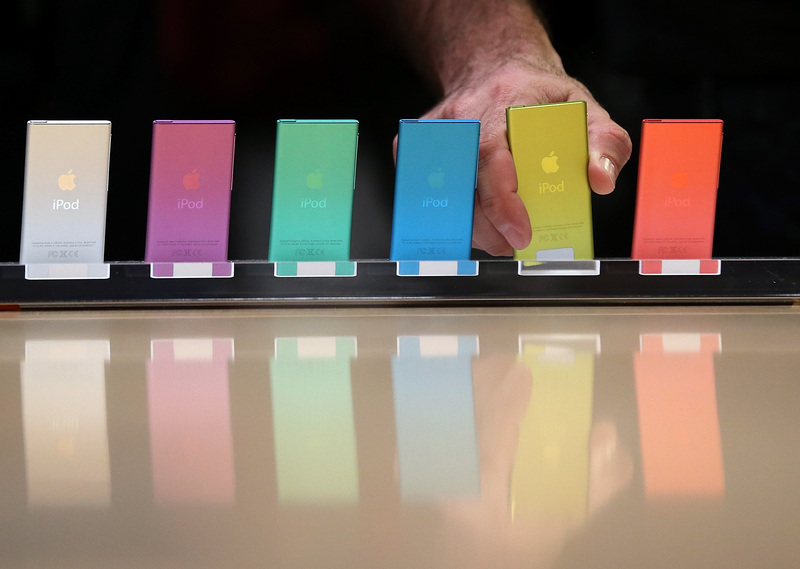 Each product served a distinct role in the iPod ecosystem. The shuffle was the entry-level iPod that took a bit of a Russian roulette approach to music playback, due to its lack of a screen. Both it and the nano the were also targeted at fitness buffs, due to their compact size and the absence of the spinning hard drive found in the classic, making them less prone to skipping on the treadmill. The nano was also the first device to work with the pioneering Nike+iPod fitness tracking system. All in all, a dozen years isn’t such a bad run. And like the classic before them, the products will no doubt live on through eBay auctions for generations to come.